If you’re looking for a dentist that serves the Greater Madison, WI Area, you’ve come to the right place. TMJ and Sleep Center is an established dental practice with a modern, gentle approach to oral care. Our goal is to provide quality care to every patient who walks through our doors, and we achieve this objective through attentiveness, open communication, and patient education. At TMJ and Sleep Center, we believe that a visit to the dentist should be as pleasant and stress-free as possible. That’s why our Middleton, WI dental office was designed to keep patient comfort in mind. Whether you need to schedule a comprehensive TMJ Examination, Sleep Examination, or Orthodontic Consultation, we’ll address any concerns you might have prior to treatment and answer all of your questions in a relaxed, pressure-free setting. What is a cure worth to you and the members of your family? Do you want your symptoms to be treated and cured? You need to ask your provider what credentialing toward treating/curing TMJ disease they possess. Is there an end point to your TMJ treatment? Did you know TMJ disease runs in families? Did you know splints, braces, and surgery do not cure TMJ? At TMJ and Sleep Center we use treatment/measure of muscles and posture, which is instrumental in curing TMJ. Read more about the topics listed above and the solutions that TMJ and Sleep Center can provide. Call (608) 833-0865 to schedule a free cure consultation or your full TMJ exam and evaluation. The TMJ/Sleep Center prides itself on successfully treating patients with TMJ/Sleep disorder in a NON-SURGICAL manner with objective documentation throughout the course of treatment. Our extensive list of satisfied patients is ever growing and our expert specialized treatment is designed to eliminate your symptoms in a non-invasive manner. We have recently added The ProMax X-Ray Machine to our office, which brings new possibilities for treatment planning and maximizes the safety of our imaging procedures. 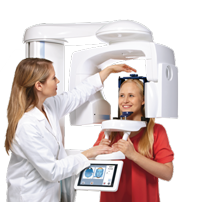 This unit complies with the best practices in dentistry by following the American Dental Association’s ALARA (As Low As Reasonably Achievable) radiation principle to minimize the effective radiation dose to our patients. The unique features of this unit allow us to choose what area of the teeth and facial anatomy we need to capture, which significantly reduces any unnecessary exposure. Our staff can also adjust the unit’s settings, allowing us to capture only the details we need. We will be using this unit state of the art software applications for the best possible care using the latest technology. “TMJ Disorder” typically describes dysfunction of the jaw muscles and joints. It can be as minor as a slight clicking or popping sensation when the mouth is opened and closed, or as serious as persistent pain extending into the face, neck and shoulders.